Keith Hutson reading at The Square Chapel Arts Centre in Halifax, 15 March 2019. Photograph by Ant Robling. 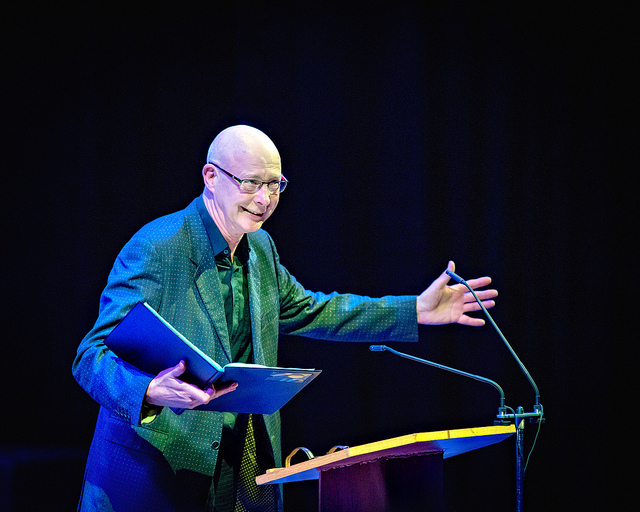 Keith Hutson's debut collection Baldwin's Catholic Geese was published by Bloodaxe on 21 February 2019, and launched with readings at the Royal Exchange Theatre in Manchester and at Halifax's Square Chapel Arts Centre on 11th and 15th March (both hosted by Poet Laureate Carol Ann Duffy). Keith will be giving more readings alongside Carol Ann Duffy in the autumn. Through vivid portraits, the book looks at the delight and heartbreak of being human through the lens of beloved music hall stars, as well as long-forgotten variety acts of the past. It acts as a comedic chronicle of social history that, in the words of Carol Ann Duffy, illustrate 'something timeless about ambition and the human spirit'. Carol Rumens discussed Keith Hutson's poem 'The Opener' from Baldwin's Catholic Geese in her Poem of the Week column on The Guardian website. 'The collection delivers the comedy and oddity its title promises, but amounts to very much more than a novelty act. It’s a commemoration.'. Read the column here. A podcast interview with Keith Hutson on Two Minutes Stories can be heard here. Keith read 'The Audience' from Baldwin's Catholic Geese and spoke about his poetry and his life in comedy (from 28.50). The line- up includes some amazingly talented young performers such as Blue Saint, Jordan Fleming and Connor Owen plus some more seasoned poets like David Bateman and Keith Hutson. Tickets FREE but places limited, so please book in advance. Keith will read alongside fellow Bloodaxe poet Hannah Lowe. For details, visit the Vanguard Readings Facebook page. '... a tonic – a fizzing celebrant of often unremembered lives... There’s more than artistry to Keith Hutson’s peerless volume.' - Steve Whitaker in The Yorkshire Times. Read the review here. Keith Hutson reads and introduces his poem ‘The Audience’ about Les Dawson, one of the many comedians he worked with before moving from comedy script writing to poetry. Keith Hutson reads and introduces his poem ‘Hylda’ about the rise and fall of comedienne Hylda Baker, familiar to television audiences as the mouthy proprietress of Pledge’s Pickle Factory on ITV. Keith Hutson reads and introduces his poem ‘Accept No Imitations’ about J.D. Plummer, a resourceful Victorian impresario whose final tragic fate was beyond his control. Keith Hutson reads and introduces his poem ‘Glasgow Empire’ about the notorious theatre where even the most famous comedians were booed off the stage. Keith Hutson reads and introduces a selection of poems from Baldwin’s Catholic Geese. Neil Astley filmed Keith Hutson at his home in Halifax, West Yorkshire, in February 2019.